George Heard Hamilton: Mr. Duchamp, so many people want to know about the readymades these days. I was wondering if you could tell us a little about them: for instance, how many of them have there been? Marcel Duchamp: Well, I can count a small dozen of them. I can even list some of them here. The first one was in 1913. It was a bicycle wheel. George Heard Hamilton: Just an ordinary wheel? Marcel Duchamp: An ordinary wheel, a bicycle wheel on a stand. The mobility, the movement of it, would be like a fire in a fireplace; you know-it has the attraction of something moving in the room while you think about something else. Then the second one was a bottle dryer, a French model, of the kind they have in cellars. In French cellars, they put the bottles up. George Heard Hamilton: The wine bottles? Marcel Duchamp: You put them on it when they are empty. And then the third one was a snow shovel, which I did here in New York when I first came in 1915. It was just a plain snow shovel. George Heard Hamilton: Just an ordinary commercial shovel? Marcel Duchamp: I bought it in a hardware shop. And it's new-a replica of it is in Yale. And then another one was called Why Not Sneeze? Of course the title is not a descriptive title, because that readymade was a birdcage, a small birdcage, in which instead of a bird there was a square cube which looked like sugar-sugar cubes. George Heard Hamilton: Cubes of white marble? Marcel Duchamp: Yes, because I intentionally made it of marble, although for the onlooker it looks like sugar. George Heard Hamilton: When one picked it up, it was extraordinarily heavy. Marcel Duchamp: That was the pun, the visual pun - that when you picked it up, you understood it was marble rather than sugar. I also added a thermometer to it. Well, this has nothing to do with sneezing, you may say, but the fact that it has nothing to do with the title was also intentional and to bring more of the readymade effect, you see. Then there came another one that was what you call 'readymade aided' -assisted, you know. In other words, I added a few details to a completely ready-made thing. For example, in this one I aided by adding plaques of brass screwed together and holding in between the two of them a ball of twine. George Heard Hamilton: Why the title then 'With hidden noise'? Marcel Duchamp: Because there was a noise in it. I gave this to my friend Arensberg and he put in the ball of twine, without my knowing it, some metallic thing. I'm sure it was metal because when we screwed the thing up and he shook it, there was a noise. There was something inside which I never knew. Arensberg is dead now. I'll never know unless I undo the thing, and I will not undo the thing. Another one was the vial. I was in Paris in, I think, 1919 or somewhere around then, and I was thinking of bringing back a present for Arensberg in California, so I went to a drugstore, and said, 'Will you give me a vial, but you'll empty it of whatever serum is in it, and seal it again, and what will be in it will be Paris air, air of Paris.' Of course, it had to be. So the druggist did it and I brought my present to Arensberg in California and it was called 'Vial with fifty cubic centimetres of air of Paris'. George Heard Hamilton: Was that the last of the actual readymades to be manufactured? Marcel Duchamp: Yes. Maybe there are one or two that I don't remember now, but in my notes in the Green Box there are mentioned some that could be made or done. I call them the 'reciprocal readymades'. You take a painting by Rembrandt and instead of looking at it, you use it plainly as an ironing board. You iron your clothes on it, it becomes a readymade-a reciprocal. George Heard Hamilton: It's rather hard on the Rembrandt. Marcel Duchamp: It is, but we have to be iconoclastic. George Heard Hamilton: Mr. Duchamp, there are two kinds of readymades: those which existed, so to speak, already before you came upon them, and those which you have assisted. Do you put any priority on one kind rather than the other? Marcel Duchamp: No. I just sort of add a little diversity to the idea. As I said, it was not a very active part of my life. When you make one or two readymades a year, you have plenty of time for something else. George Heard Hamilton: Do you think anybody else could make one? Marcel Duchamp: Yes, everybody can, but as I don't attach any value, commercial or even artistic, to it, hardly anybody would do it for the sake of doing it. But some people have done it, in fact, like Joseph Cornell in America, who has used the idea indirectly. George Heard Hamilton: But his are much more elaborately constructed? Marcel Duchamp: Yes, of course. They come out of the idea of the readymade but with an elaboration of his own. I mean, his own invention. George Heard Hamilton: Is there any way in which we can think of a readymade as a work of art? Marcel Duchamp: That is the very difficult point, because art first has to be defined. All right, can we try to define art? We have tried, everybody has tried, and every century there is a new definition of art. I mean that there is no one essential that is good for all centuries. So if we accept the idea that trying not to define art is a legitimate conception, then the readymade can be seen as a sort of irony, or an attempt at showing the futility of trying to define art, because here it is, a thing that I call art. I didn't even make it myself, as we know art means to make, hand make, to make by hand. It's a hand-made product of man, and there instead of making, I take it ready-made, even though it was made in a factory. But it is not made by hand, so it is a form of denying the possibility of defining art. You don't define electricity; you see see electricity as a result, but you can't define it. I remember that a professor of physics always said that you cannot define electricity. You can't say what it is but you know what it does. You see, that is the same thing with art: you know what art does but you don't know what it is. It is a sort of inner current in man, or something which you don't have to define. The first definition is not necessary. But with the readymades it seems to me that they carry out of the world of everyday life-out of the hardware shop, as in the case of the snow shovel-something of your own sense of irony and wit, and therefore can we believe that they have some sort of message? Not message but value, which is artistic even though you haven't made them. The actual intention in choosing and selecting, in setting them aside from everything else in the world, does that not give them some kind of possibly intellectual value? It has a conceptual value if you want but, it takes away all the technical jargon. I don't know whether it means exactly what we want to say. Painting should be made with colours; painting should be made with pencil, with brushes, and when you take something that is not made by those technical instruments, then you feel you don't know where you are. You don't know whether you should take it as a work of art, and that is where the irony comes in and yet, as you say, it is the artist's choice to make that decision, to sign it as a work of his own. George Heard Hamilton: The irony, of course, is very much part of the world of the First War. Marcel Duchamp: Yes. It was a very important form of introducing humour in a very serious world at that time. 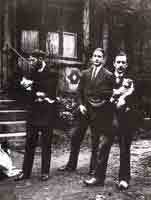 The Duchamp brothers - (left to right): Marcel Duchamp, Jacques Villon and Raymond Duchamp-Villon, ca 1913. George Heard Hamilton: You said once to me, some years ago, that the Dada spirit had been operating in New York - with you, for instance, and with Man Ray - before Dada was named as a movement? Marcel Duchamp: Oh yes. It was in the air, as many of these things are, and we certainly had the same spirit as that in Zurich, and started under the same name. They invented a name and of course the name was a good sort of flag around which all these ideas crystallized. But even before the war there was a Dada spirit. It has always existed. Rabelais is in essence a Dada. George Heard Hamilton: Would you consider that Dada is more than just a criticism of art? Marcel Duchamp: It is-much more. It has many more intentions. It is the nonconformist spirit which has existed in every century, every period since man was man. It is just that this time round they found a name for it. George Heard Hamilton: Could we turn for a moment to another work, which is the Large Glass now in the Philadelphia Museum. Is the 'Large Glass a Dada work, would you say? Marcel Duchamp: I wouldn't say that - no, no. It was started long before the word Dada was invented in 1912-14, before the war, and even though I tried in that big glass to find a completely, personally new, expression, the final product was to be a welding of mental and visual reactions. In other words, the ideas in the Large Glass are more important than the actual visual realization. George Heard Hamilton: But this sounds almost contradictory because a work of art is primarily a visual experience. Marcel Duchamp: Yes. But this welding of two different sources of inspiration gave me a satisfactory answer in my research for something that had not been previously attempted. You see, I was the young man who wanted to do something by himself and not copy the others; not use too much of the tradition. In that quest my research was to find some way of expressing myself without being a painter, without being a writer; without taking one of these labels, and yet producing something that would be a produce of myself. As I said, this mixture of idea and visual representation attracted me as a technique, if it has to be a technique at all. George Heard Hamilton: You had to invent everything for the first time? Marcel Duchamp: Yes, because Courbet's revolution was mainly visual. He insisted, without even mentioning it, that a painting is to be looked at, and only looked at, and the reactions should be visual or retinal, not much to do with the brain. A plain physical reaction in front of a painting. This is still in vogue today, if I might say so. Expressionism is the line, the form, the play of colours together and the more abstract the better. Jacques Villon, Marcel Duchamp and Raymond Duchamp-Villon. George Heard Hamilton: And all that has nothing to do with your plan? Marcel Duchamp: I thought it was a reaction against the retinal conception of painting, and I think it still is. Literary painting has been done before, but my art is not literary. It is much deeper than that. It uses words, but using words is not necessarily literary. George Heard Hamilton: But it also means that we could never reduce the visual elements in the Large Glass to verbal? Marcel Duchamp: Exactly, because the other side, which is important, is description - the literary part, if you prefer it. The description of the visual part is the literary part. That is why I say welding; the welding of the two sources is very important. George Heard Hamilton: Are there any ready made elements in the Large Glass? Marcel Duchamp: Hardly no. There was hardly any ready made activity at that time. George Heard Hamilton: Perhaps this is too difficult a question, but does the Large Glass now mean things different to you from what it meant when you were working on it? Marcel Duchamp: No. You know it never was finished. I worked on it until 1923. It got broken and then I repaired it to have it in good shape, but I couldn't work on it any longer because it was split into two. So it never was finished and really, it does not matter, because the notes help to understand what it could have been. As I said, it is hardly to be looked at, so whether it is there or not, is not important. Some of the notes, the written notes, explain what could have been done on it, drawn on it. George Heard Hamilton: Do you think people understand it the way you would like them to, or is it subject to interpretations, like so many works of modern art? Marcel Duchamp: I don't think people take time to understand it; it is not an attractive subject for the public today. Collectors take a different attitude today: they regard art as a commodity, a thing that they put on their walls, a conversation at table. 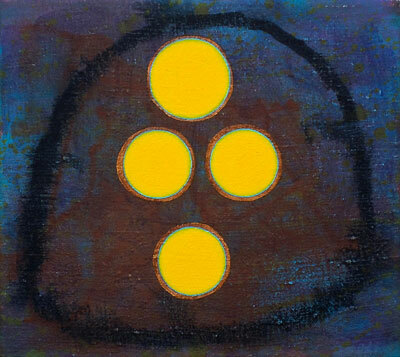 Painting, art in general, has become such a conversation piece. But in the Large Glass there is nothing to converse about, unless you make an effort to read the notes in the green box, but who cares? I mean, it is not interesting for the public today; it has no public appeal. Marcel Duchamp: Well, art students might be interested in it. In fact it has no appeal for the public at large. I notice it very much. George Heard Hamilton: Is it fair to think of the Large Glass in terms of works of the same time which have mechanical elements in them, such as the paintings of Picabia? 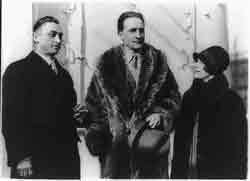 Marcel Duchamp: Oh yes, we were very great friends, Picabia and I. We were together all the time in Paris. Picabia's mechanical drawings of 1914-15, his absolute copies, were actually in the same spirit. They were more aesthetic since he wanted to make a drawing a work of art, while I tried to avoid that kind of artistic effect. That was the difference between the two of us. There was an American boy whose name was Schamberg, who died very young. You know, he disappeared. He even made some readymades. One of them is in my room in the Arensberg Collection in Philadelphia. George Heard Hamilton: Picabia would have seen the Large Glass when he was in New York during the war, wouldn't he? Marcel Duchamp: Yes. He saw it when he came in 1916. I was here, we were together all the time. George Heard Hamilton: Mr. Duchamp, if your works are ironic reflections upon the difficulties of defining art as a function, a process, is it wrong to exhibit them in art museums? Marcel Duchamp: No, it is not wrong because, after all, even if they are supposedly ironical, they still belong to the same form of human activity. Whether you object to their conception, they are still in the same medium. They are not scientific, they are artistic, even if they are against art in this way. * Conducted in New York on 19 January 1959 for broadcast on BBC Radio, Third Programme on 13 November of that year and repeated on 12 August 1960.